Until recently my attachment to records has been more or less superficial, but when I started buying ethnographic records a couple years ago I began to see how they are loaded with cultural significance for both the listener and the cultures producing them. 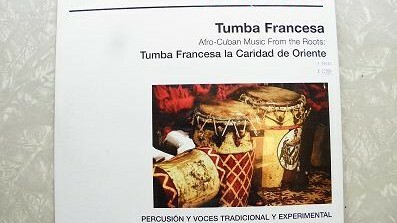 On one such recording, entitled Afro-Cuban Music from the Roots: Tumba Francesca la Caridad de Oriente (subtitled “percussion and voices traditional and experimental”), I heard how a musical performance can be hugely influential to both the tangible and spiritual elements of a culture’s identity. Now, after being a part of the Record Store project and meeting luminaries such as Seattle’s own DJ Riz, known for his role in the independent radio station KEXP, I can firmly say, and I don’t think I’m alone here, Records are my religion. Afro-Cuba – Tumba Francesca. 2006. Soul Jazz Records. Personal photograph by author. JPEG file. Records are an audio phenomenon in a vinyl medium. Vinyl is a medium formatted to articulate a musical vision and in exchange the music acts as the idea-force behind the record. The idea of the neighborhood record store, now often a rare survivor of a former era, is a space with the power to put these receptacles of music’s most essential qualities into the world. Records are indeed objects of beauty, and I would go further to say they are objects with allure and seduction. We are drawn to the music and what it evokes in us when we put a record on a turntable. Through the attraction we are able to relive familiar moments from the past or become familiar with new musics of the world. Part of this draw is how records allow us to derive pleasure from a listening experience and the recognition of our own “place” in that moment in time. In the same vein architectural space may be viewed as “a setting into work of truth through recognition and orientation.” To quote the architectural historian Alberto Pérez-Gómez, “the space of architecture, always elusive and mysterious, is the space in which we may perceive ourselves, if only for a moment, as whole.” In his Timaeus Plato names this space the “chora,” or the third element of reality in which we encounter our “other half.” I saw this happen in the Record Store all the time, especially when a slow jam like Bobby Womack’s T.K.O. made its way onto the speakers. 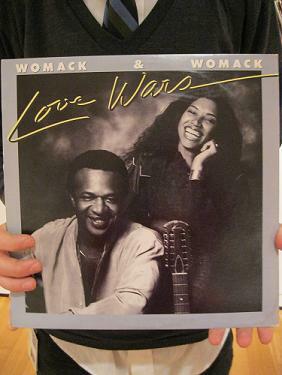 Love Wars by the R&B duo Womack & Womack. 1983. The Listening Room, Seattle, WA. 2 March 2012. Personal photograph by author. JPEG file. Reflecting on my time at the Record Store there is no place I could have better pictured myself after coming out of the ethers of academic life. Although the storefront Record Store is in the process of transformation the idea, like the song, remains the same. In fact you will be able to see the Record Store “popping up” again in the future so stay tuned in to the music.